Short Little Mama's: Aldi, Scott's, Bakery Shopping- No Coupons! Aldi, Scott's, Bakery Shopping- No Coupons! Monday I went to town, hoping once more to find the ellusive free or $.49 Huggies babywipes that were part of Dillons Mega Event the past 2 weeks. Four stores, and no luck. 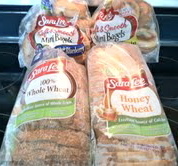 So, as a consolation, I decided to try shopping the Sara Lee Bakery in Salina that my friend is always telling me about. We have been all out of fresh fruit, not counting what I have frozen, and the boys have been begging for it. Since we didn't spend anything at Dillons, I decided we had the time and money to grab a cart full of some healthy edibles. Of course, a few other necessities made their way into the cart as well. Not only were no coupons needed, they wouldn't have been allowed anyway. Finally, after my husband made it home, I had a few quick errands to run. On my way home, I remembered the $1 bags of Malt-Meal cereal at my local Scott's Hometown Foods. A few couponless deals later, I completed a successful day of saving coupon-free!